Are you using alternative search engines to increase your website traffic? Do you know 5% to 8% of people in the world still using other search engines? Most of the tech-savvy people around the world use Google to find the required information, products, services, etc., on the web. There are various reasons as to why people use this search engine to rather than using other alternatives. Even all those individuals who enter into the web-based business, take all possible measures to get their site ranked well in Google’s SERP, obtain more business opportunities, and earn lots of money within a short duration of time. From the above-mentioned chart, it is clear that you can get several chances of business even if your site is ranking well in the SERP of alternative search engines. The problem with Google is that it uses approx 200+ parameters to determine the ranking and relevance of websites. It also releases SEO updates from time-to-time. So, a sudden change in SEO practices makes it difficult for digital marketing professionals to optimize websites very well and maintain the best ranking at all the times. So, today we will discuss how alternative search engines lift your web-based business. Let’s get started. Different search engines have different parameters to determine the ranking and relevance of websites. It takes a lot of time to create a lot of time to create and optimize websites and make it a money churning source. Most of the individuals optimize their websites and blogs as per Google’s standards to get more business opportunities easily in a short time span. When their site doesn’t perform well in Google’s SERP, they suffer a lot to survive in the business. One must always keep in mind that all search engines try to give the best results to users. So, if you optimize your website keeping the user’s need in mind, your website will rank prominently on all search engines. It will help you to get sufficient business opportunities at all the times. It also assists you to compensate the loss easily if your website declines in Google’s SERP all of a sudden following unexpected things and updates. All search engines release algorithm updates from time-to-time. With these updates, they target Black Hat SEO practices and instruct the digital marketing professionals particularly SEO Specialists to optimize their websites/blogs as per the latest SEO tricks for better SEO ranking. Compared to other search engines, Google releases its algorithm updates frequently. Almost all Google algorithm updates affect the ranking of websites negatively if they don’t follow the specified SEO standards. Just optimize your website very well and avoid the unethical practice of black hat SEO. This will help your website to sustain all types of algorithm updates. It will provide you a stable web-based business even if your site’s ranking is not satisfactory on Google. All website owners want to improve the consumption of the web content as far as possible to get more business opportunities, sell premium products, and increase revenues. If your website is ranking well on alternative search engines, you see a huge flood of traffic from all locations of the world. So, create unique, SEO-optimized, and informative content & use it for website optimization. Add translation feature to your website so that visitors can easily read useful content in their preferred languages. All these activities help you to sell your content on the web and make them go viral in a short duration of time. A live content with high downloading rate and social sharing helps entrepreneurs to fetch more business easily. Most of the website owners get business proposals and assignments from a few countries only. They don’t bother to seek the potential business opportunities available in several countries with the Highest Internet Penetration Rates. So, they seem unwilling to place ads on alternative search engines because of their perception of lower exposure of advertisements. If you want to take your web-based business to the international level and seek all possible business opportunities, just advertise your brand in areas (using alternative search engines) where your competitors are absent. It will help you in the long run in terms of business opportunities, acquisition of new clients/customers, revenues, etc. A good number of individuals place PPC ads to get instant results when they fail to achieve their business objectives through free of cost search engine optimization. As Google is a leading search engine, so most of the companies advertise on Google rather than other search engines. 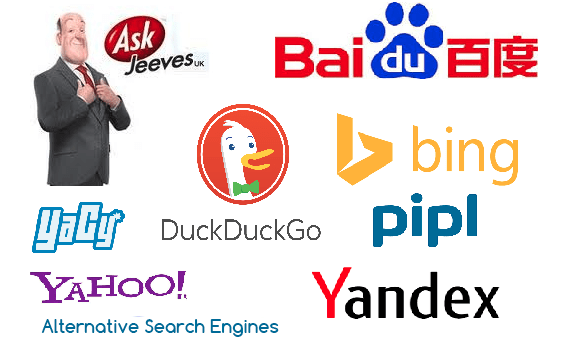 Don’t underestimate the huge business potential of different alternative search engines. Just optimize your website very well for the end users, get business opportunities coming from all major search engines and keep expanding your web-based business continuously. You make good points. I am planning an article on why people should use Google. I hadn’t considered these points. Happy new year to you! This post is a timely reminder for many digital marketing professionals to take sufficient action while optimizing a website. Thanks for coming up with a very useful topic. Keep up the good work. Have a great time blogging and have a very prosperous 2018. Interesting ideas about sneaking in some extra eyeballs by targeting less popular search engines. This post fits nicely with my goal to make 2018 the year I finally tackle SEO and make the search engines play ball with my work. Thanks for expanding my thinking. We all work to please Google and don’t consider any other search engine for that matter. The market share of the alternative search engines may not be high, however, the smallest one also can attract some significant number of traffic. The benefits from different search engines are truly manifolding. Thank you for sharing them in detail.